Fast forward to August 1, 2017 when a stack of Schiit arrived at Computer Audiophile headquarters. 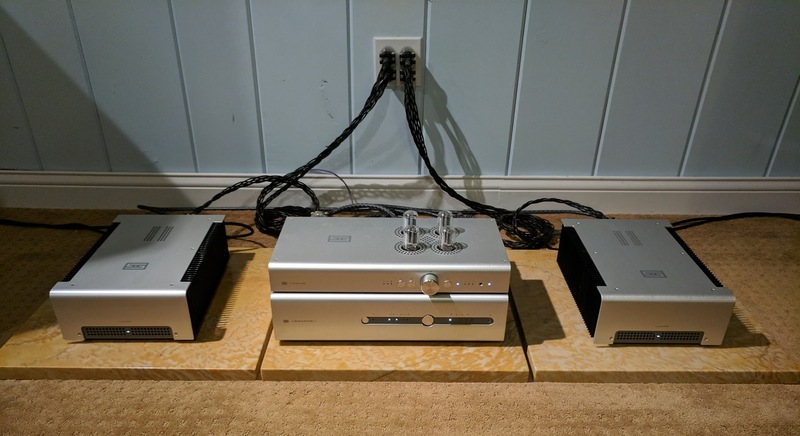 Jason sent a pair of Vidar amps for testing a mono configuration and the Freya preamplifier. Shortly after connecting the amps, I ran into a strange issue, as documented here (link). I mention this only to show how responsive Schiit is to customer service issues and how quickly the company found and resolved the issue. Sure the process was delayed because of Jason's travels to see the August 24, 2017 total solar eclipse here in the US, but rest assured he won't delay any repairs again until April 8, 2024 when the next total solar eclipse is visible here in the US. Only kidding. Jason did see the eclipse and that did delay his looking into the issue, but I would have done the same thing. Plus, because of this delay, he sent me two brand new Vidar amps so I could continue my review without waiting for a resolution. The CliffsNotes version of the issue: Jason changed the compensation capacitors to current production parts in the Vidar amps I returned, and all was just fine. After receiving the new Vidar amps, taking a short family vacation, and attending the CEDIA 2017 trade show in San Diego, I'm ready to jump into the Schiit. I have the Schiit flagship Yggdrasil DAC connected to the Freya preamplifier and a monoblock pair of Vidar amps. This is what I consider the Schiit Audio reference system. I also have a Schiit Bifrost DAC ($399) for comparison as well. Prior to starting the Schiit review, I talked to a few manufacturers about sending loudspeakers here for use with the Vidar amps. Given the conservative power rating of the amps into a 4 ohm load, when configured as monoblocks, I think it's wise to test different speakers and report my findings. Here are the components and loudspeakers I plan to use for this Schiit Audio reference system review. My plan is to use the Schiit Audio reference system in many different configurations and really give the Vidar amps a workout. Based on my first cursory listening sessions with the complete Schiit system, I am very impressed. I've had my TAD CR1s connected to the Schiit electronics while awaiting the arrival of the other loudspeakers and while playing music throughout the day while I work. Of course I frequently spin my chair around, away from my desk, to crank the volume when feeling inspired. I've yet to find the breaking point of the Vidar amps, and that's saying quite a bit. I like to play my favorite music at levels that indicate, to the neighbors, that it's my favorite music. I don't plan on pushing the amps until they shutdown, but I won't shy away from using them how I listen to music. So far, so good. Actually, so far, very good. Much more to come in my full review of the Schiit Audio reference system in combination with several loudspeakers and sources. I'm seriously looking forward to the fun. It's starting to look like a dealership showroom. Any demos for sale . Can't wait to hear your final results. Now that the photo has been taken, I have to move the unused speakers out, so they don't interfere with the sound. Really looking forward to this review. Thanks! Chris, you should really think about spending some time and effort to optimise the acoustics of your room. Wow, this will be fun, as interesting as a full Schitt system under review is, I think the more interesting aspect will be the control of a single synergy system across 4 different speakers at different price points. Especially interested in the big differences between the Focal and Sonus Fabers and how well they are handled by the Schitt system. Two speakers that are on my future auditioning list. Matt, please give us a hint as to your overall satisfaction with these speakers with the Schitt system compared to your reference TAD. The TAD and Dynaudio seem more extremes to the price point of the full Schitt system (keeping with the rule of thumb speakers being 50% of overall budget). Where do you plug in a headphone in this setup? I currently use the headphone plugin on front of my old Yamaha vx-r2500 AVR my original Schiit Magni I find tiring and harsh sounding (as opposed to using my ME 2 headphone outs). If I have to 'upgrade' the headphone amp I will lose one of those precious 3 RCA inputs on the Yggy- is that correct? Also on the Yggy does it finally decode DTS/5.1 from a cable box or will I now have to just connect with RCA connector from cable box to either the Yggy or the Freya and what does it sound like like the sound from my TV/monitor speakers now? I have toslink from cable box connected to that old AVR. Interested in learning more about your "stack of Schiit". What will your source be? Also, a high end power conditioner and/or a set of isolation devices(e.g., StillPoints) quickly overwhelms the budget for a price matched Schiit set up and yet I'd imagine that such purchases could still be easily justified. Any remote for the pre or DAC? Did you stitch a panoramic shot together for that picture or is your rear wall curved? If not the former I think your carpenter was off kilter that day. Or you are suffering some spatial distortion in the matrix at your location. Probably due to the glitch in the Yggy DAC chip. Military chip you know. I wonder how Schiit sounds. I think my carpet layer was off that day as well. Or, he didn't realize I'd be moving heavy equipment in and out and sliding it in the floor. I need to have it fixed (I heard it can be stretched). I'm looking forward to your Schiit Stack review. If you have a bit of extra time and access to a Ragnarok, please use it as the preamp and compare to the Freya. Well is it good Schiit? I am most curious how you feel about the focals!